unemployment – Write. Snap. Click. CAPE TOWN 02 JUNE 2017 – Leading South African corporates have committed to creating more than 300,000 jobs annually, following the announcement that a staggering 58 percent of South Africa’s 14.6 million unemployed people are aged between 15 and 35. Watch full story here. Last week I gave an impassioned speech to a group of young, soon to be journalists at my alma mater. I told them that this might possibly be the best time to be a young journalist, the opportunities are endless, and other such brochure stuff. They believed me. Hell, I believed me. And a part of me still does – there is so much we can do, yes we’ll run into and slog under organisations that are counter-revolutionary but it can be done. We can be authentic to ourselves and each other while running on this side of the tracks. But a part of me faltered and scoffed at the hypocrisy of that talk we had when I read a report with statistics on everything “born free” and my oh my do the numbers look bleak. The report, Born Free But Still in Chains: South Africa’s First Post-Apartheid Generation, was released by the South African Institute of Race Relations last week. 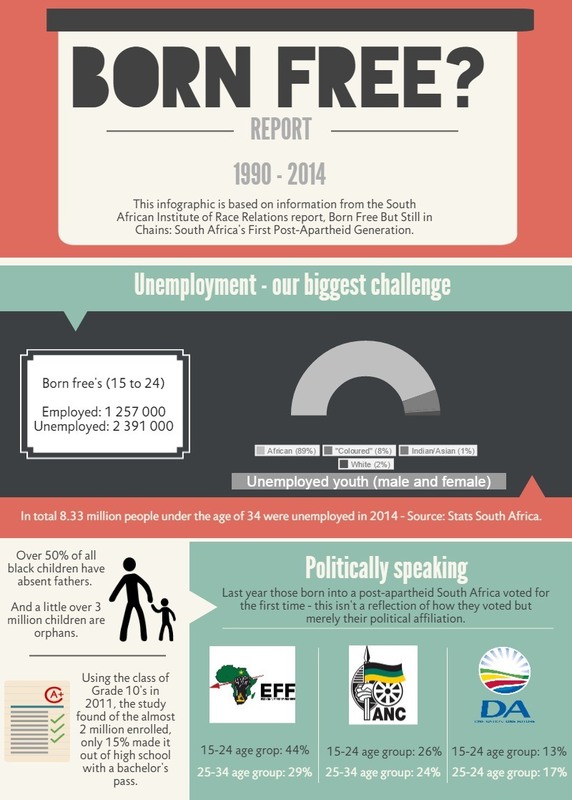 Luckily their definition of a young person is different from Stats SA (which includes everyone between the ages of 15 and 34), in this report Born Free’s are defined as people under the age of 25. The statistics aren’t new but I thought about the numbers a lot more personally this time – they are alarming, they are dire, they speak to a crisis even. They speak to the brazen young men we see and speak to at protests, the young girls who want my details so they can get a job (even if it is just carrying my camera bag). They speak to the anger on timelines and the rage that breaks into our homes and smashes windows. The numbers mattered more now because I see the faces behind those numbers every day and that realisation makes it all so real. In the report unemployment and education are highlighted as the two biggest concerns we have – unsurprisingly the former is often caused by the latter but not always. The bulk of those unemployed did not complete their secondary (high school) education, and on the other hand almost 400 000 varsity graduates sit without work – so who’s to say having a degree helps these days. I have no answers at all, but I do know that the columns and warnings about us being a ‘ticking timebomb’ are true. We’re the generation that won’t let the empty promises be the hope we cling on to, we want answers and action and it makes me so happy to know that we are inching ever closer to making ourselves heard. It’s already happening, it’s already here. Like Fanon said we just have to collectively fulfil our mission, I think we have already discovered it. These statistics cannot continue to rise. That there are people in positions of power who are blase about them (if I’m being polite) is sickening. They should know that their protection now is temporary, if we have to destroy to build they might be collateral – something to think about while they can. There was a wealth of information in that study that also spoke to how many children are orphans, how many (overwhelmingly black) are child headed households, how HIV/Aids has affected them, how many have never received any early childhood development, how their living conditions haven’t changed in 21 years (sleeping on the floor, washing and relieving themselves in buckets), their dreams and their hopes. Read it. Gain some perspective before you run around telling people they are “lazy” – there are millions of children who have to fight every single day just to stay alive, be cognisant of that.